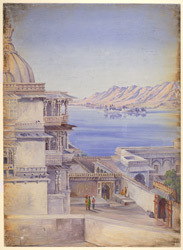 Oil painting on paper depicting Pichola lake and the island of Jagmandir, Udaipur by Marianne North dated 1879. Inscribed: 'In the Palace. Oodipore. Decr. 1878'. Initially Marianne North (1830-1890) only painted botanical specimens and travelled around the world in search of interesting subject matter. She visited India in 1877-79 and completed over 200 paintings whilst there, painting landscape views as well. Udaipur is the new capital of the Mewar State (Chittor was sacked in 1567) and was founded by Maharana Udai Singh (ruled 1567-72) of the Sisodia Rajputs. It is located on the east bank of Pichola Lake and the town is dominated by the main royal residence in Udaipur, the City Palace. This consists of an impressive series of buildings in the Rajput style, flanked by octagonal corner towers surmounted by cupolas. Inside the palace is a maze of reception halls, residential suites and internal courts. On the lake there are many palaces built on small islands that were used as summer retreats and pleasure pavilions. Construction began on Jag Mandir, the palace seen in the distance in this view, in 1551 and was completed under Maharana Jagat Singh I (r.1628-1652). In her autobiography, 'Recollections of a happy life' of 1892, Marianne North wrote, "We...mounted by steep terraces and steps to the very top of the huge marble palace. No views could be more superb than those from the upper storeys, over lake, city, river, and mountain. The marble lattice-work of windows and balconies was most wonderful. Sometimes it was filled with coloured glass, which cast lovely tints on the polished white floors and walls."